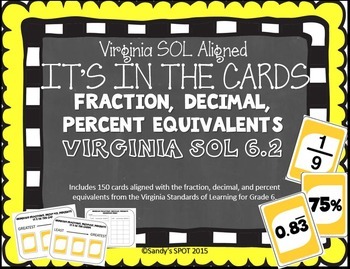 This set of 150 cards...with FRACTIONS, DECIMALS, PERCENTS that align to Virginia Math SOL 6.2 is a great resource. Included in this product are the 150 cards in standard card size (8 to a page) and also half page size so you can print and use them in a variety of ways. You also receive recording sheets and answer keys. Ideas for using the cards for at your seat or center activities, games, or problem of the day activities are included...but of course you will think of even more ways to use these cards with your students. If you teach FRACTIONS, DECIMAL, PERCENT equivalents and representations, these cards will be an awesome resource.